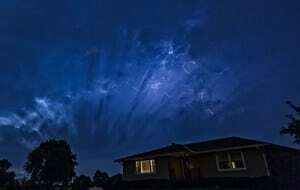 Everyone has seen those epic images showing bolts of lightning leaping from the clouds and blazing a trail to the horizon. Lightning is an amazing display of the sheer power of nature, giving us but a brief glimpse of the incredible forces at work in the world around us. You may have wondered how those images of lightning were created and if you can make similar images with the gear you have. The nice thing is that you don't need a ton of expensive gear to photograph lightning and you may be able to do it right in your own back yard. However, photographing lightning is not a particularly easy thing to do. Lightning is unpredictable and it can be dangerous. Having a solid plan of attack is vital to increase your chances of safely and successfully capturing some nice images. This article will provide a few tips to get you on your way, but it is important to note that, as is the case with any type of photography, the more you do it the better you will get. Staying safe while out shooting lightning (or any type of photography, for that matter) is something that should be on our minds any time we go out. Safety is likely to be one of my tips, or at least will be part of the discussion, for any articles that I write about going out into nature to photograph things. As you might have guessed, I'm that guy who typically brings the first aid kit along on hikes or other outdoor adventures. Making sure you are safe really isn't that difficult to do and your loved ones will be glad you did. According to the National Weather Service, there are an average of 49 fatalities and hundreds of injuries due to lightning in the United States each year. It is perhaps the most under-rated dangerous weather phenomenon and can happen anytime and anywhere that storms are present. Lightning safety is something to be taken seriously. No one wants to be one of those statistics and no photograph is worth putting yourself at risk of becoming one. There are a few common sense things to consider when shooting lightning. There is a saying that goes, “When thunder roars, go indoors”. In other words, if you can hear thunder, then you are within striking distance of lightning. You may be able to photograph lightning in an oncoming or distant storm, but if you hear thunder, then it is time to head for safety. That means getting into a hard topped vehicle with the windows up or go into a building for shelter. There is basically no safe place outside when thunderstorms are in the area. Read more lightning safety tips from the National Weather Service. Keeping track of the weather that is forecasted wherever you are has never been easier. There are tons of mobile applications that can be installed on your phone that can give you constant updates on what the weather is doing in your area. One such application that I've been turned on to recently after hearing about it on the Tripod Podcast (one of the podcasts in the Improve Photography network) is MyRadar. This application, available for both iOS and Android mobile devices, provides animated, high definition radar that allows you to see what weather is coming your way. This will give you some idea of the intensity of the storm, which direction it is heading, and the approximate time it will be there. Once you have a good idea of the expected path of the storm, you may be able to get ahead of it to get some shots before it hits where you are. Or, if you are shooting from home or other familiar place, you can get an idea of when it will arrive and be setup and ready when the action starts. You may not always be in the right place at the right time, but you can at least increase your chances. There are several different types of lighting, but I won't get too far into the weeds about lightning classification in this article. The most common type of lightning is intra-cloud or sheet lightning, which is embedded in the clouds and lights up the sky in a sheet during the lightning flash. This type of lightning typically doesn't have the dramatic impact of a lightning bolt that you are looking for in your images. You may also see cloud-to-cloud or cloud-to-air lightning, which will produce lightning bolts that do not reach the ground. However, the types of images that seem to be the most popular are the ones that have the dramatic bolts of cloud-to-ground lightning. We all know how unpredictable weather can be, and getting the kind of lightning you want for your images, at the right time and place, just might not happen every time you go out. A little bit of planning will help, but a whole lot of luck comes in handy, too. As is the case with any type of photography, composition is an important consideration when you want to make lightning images with impact. 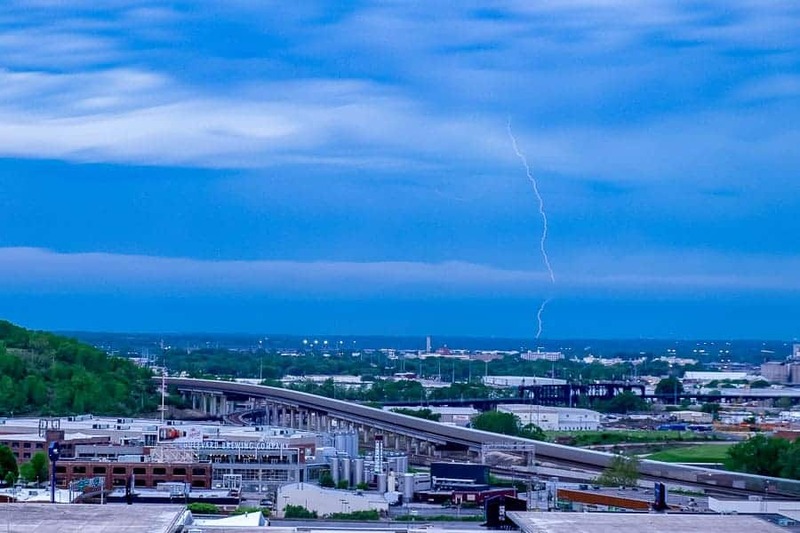 An image of a lightning bolt surrounded by sky may be a fine image, but including some part of the environment around you and on the horizon will likely make a much more interesting photo. Including things such as buildings, trees, roads, etc. will give a sense of place and also provide some scale to the image. Lightning is big and powerful, so look for ways to compose the image that will accentuate that. A little bit of pre-planning and preparation will help to make capturing amazing lightning images with a compelling composition easier. This is something that you will want to do long before any storms or lightning hit, so you don't feel pressure to get “the shot”. For me personally, I have a long commute to work each day. That provides me with opportunities to watch for locations that could be good for shooting. Over time, I have compiled a mental list of places that can be easily accessed and that offer some interesting compositional elements that can be included in my images. These locations are primarily public places that don't require any special permission to access, such as parks and overlooks. Going out shooting in new places can be exciting, but don't overlook the possibilities at home. This may not work for everyone, but if you have a good view of the horizon from your house, you may be able to set up your camera on a front porch or back deck and let the camera do the work of capturing images while you wait safely inside. Or perhaps the home of a friend or family member is better situated for capturing some compelling images. Always be on the lookout for that next best place to make some great images. The possibilities are all around us. We just have to take the time to find them. Look for some interesting foreground to include in the photo. Photo by Rusty Parkhurst. The nice thing about lightning photography is that you can get started with some basic photography gear. In fact, if you are reading this, you likely already have what you need to capture some very nice images in certain situations. 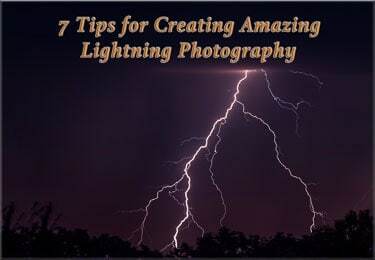 However, you've probably heard the phrase, “there's more than one way to skin a cat.” Such is the case with lightning photography, in that there are different techniques that can be used to achieve similar results. The gear that you will need for these different methods will vary somewhat, from the bare essentials to more advanced gadgetry. The techniques and gear that works best will also depend on whether you are attempting to capture lightning during the daylight hours or at night. Let's take a look at some of the different ways that lightning images can be captured, then you can decide what works best for you and the gear you have. In each case, the assumption is that you have a camera and lens, and are in a good position (think safety) to capture lightning. OK, this one is probably not going to work very well most of the time. It's not my preferred method, but feel free to give it a try and see what you come up with. As the name implies, you will essentially trip the shutter on your camera as soon as you see a flash of lightning. If you are shooting during the day, your shutter speed may be high enough to hand-hold the camera and fire away. During the night, or in low light situations, you will need to be on a tripod due to the slower shutter speeds. You can simply press the camera's shutter button to take the shots, but will be more likely to “mash” the button and increase the potential for camera shake, particularly with slower shutter speeds. The best way to do this would be to shoot on a tripod, regardless of shutter speed, and use either a wired or wireless remote shutter release for your camera. Not only will this minimize touching the camera, but will also be more comfortable than holding the camera the entire time and allow you to more easily keep on eye on the sky. There are times that lightning flashes last for a few seconds and you may be able to capture some of the action. However, most of the time, lightning happens very quickly and you will be more likely to miss most of the shots using this technique. This technique is really just a variation of the first one, and the results are likely to be about the same. Instead of firing the shutter each time you see a flash of light, you will randomly trigger the shutter with the camera pointed in the general direction that lightning is happening. Again, you will ideally be on a tripod so you aren't holding the camera in your hands, and can use either the shutter button or a remote shutter release. If you don't have a remote shutter release, you can also use the self-timer function on your camera. Set the timer to 2 seconds, then when you press the shutter button, there is a 2 second delay before the shutter is opened to take the shot. This technique is obviously going to work much better when you are able to shoot using longer shutter speeds, somewhere in the neighborhood of 5 to 10 seconds, or even longer. If the storm is producing frequent lightning, it would stand to reason that you would eventually capture some bolts on your sensor. Once again, the number of “keeper” shots you get will depend on whether you have the camera aimed in the right direction and if your timing is good. For me, it seems that when I try this, the best lightning always happens in between my shots, when the shutter is closed. If you are shooting a daytime storm, your shutter speeds are going to be pretty high because there will likely be plenty of ambient light. A good way to slow down the shutter, even during mid-day hours, is the use of a neutral density filter on your lens. A neutral density (or ND) filter is simply a darkened piece of glass that either screws onto the lens or fits into a filter holder that is attached to your lens. There are a wide variety and brands of filters. You can read more about how they work and some recommended brands in the recommended gear section of the Improve Photography website. Using an ND filter will allow you to slow down the shutter speed of your camera for shooting during the day. Photo by Rusty Parkhurst. Depending on the brightness of your scene, a 3, 6, or even 10 stop ND filter may be necessary to decrease the amount of light reaching your sensor and increase the time the shutter needs to stay open. For the image above, I was using a Lee 10-stop ND filter, which slowed down the shutter to 30 seconds. Without the ND filter, the shutter speed would have been 1/30th of a second, and I might not have captured the image. With all the high-tech features on our cameras and gadgets, why not use them to our advantage to make shooting lightning a little easier. A lot (maybe most) modern cameras have a built-in intervalometer, which allows you to program the camera to automatically take a photo at a set interval. 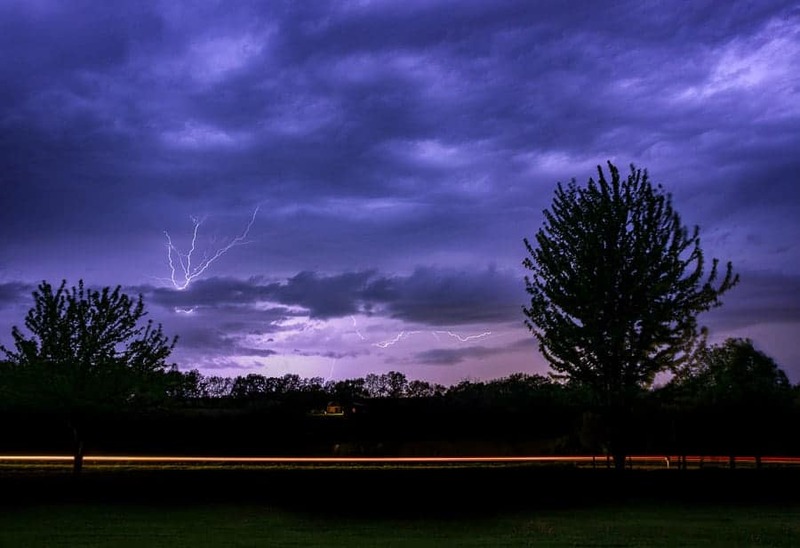 This function is great for lightning photography, because you can set up your camera on a tripod, program the intervalometer, start shooting, and then just sit back and enjoy the surroundings while your camera does all the work for you. This technique will work best when you can have longer shutter speeds of up to 30 seconds, so give it a try either at night or use an ND filter on your lens for daytime shooting. If your camera does not have a built-in intervalometer (like my Canon 5D Mark III – come on Canon! ), you can still do this using a cable release. You can get a very inexpensive cable release; just make sure you get one that is compatible with your camera. Some cable releases have an intervalometer function. If your cable release does not have this feature, or if you don't want to figure out how to program it, simply set your camera to one of the continuous release modes, then lock the remote shutter button in place. As soon as you do this, the camera will start firing and will continue to take photos until you release the button, the battery on the camera dies, or your memory card fills up. A great alternative to the traditional cable release is to get a Triggertrap Mobile Kit. I have yet to try one of these, but need a remote trigger for my Fuji mirrorless camera and plan to get one. The Triggertrap is a set of cables and dongle that connects to your camera and phone and works in conjunction with a mobile application that is downloaded onto your iOS or Android device. The application provides a wide array of features, including an intervalometer function. One drawback that I see with this device is that it needs to be connected to your phone while in use, which will drain your battery. It's worth a try, though, and gets rave reviews. Just make sure you order the kit that is compatible with your camera model. One of the disadvantages to using any of the above techniques is that you are likely to take a lot of photos, and most of them won't have any lightning in them. This means that you have to wade through hundreds of photos at the end of the shoot to find the keepers and delete the rest. Using a triggering device on your camera will limit the number of frames taken and should increase the number of images that actually have lightning in them. I should note that I have not used any of these devices, but do have photographer friends who have had good success with them. There are a few lightning trigger devices available on the market, so do your own research to find the one the that will work best for you and your camera. The lightning trigger is basically a small box that attaches to the hotshoe of your camera and has a cable to connect to your camera body. The triggering device is sensitive to changes in ambient light, and when there is a sudden change, such as that of a lightning flash, it will automatically trip the shutter on your camera to take the shot. These devices would work well for any time of day or night shooting, but would be especially useful for triggering the camera during daytime storms. One such device is the MK Controls Lightning Bug. This trigger is sensitive to the infrared pulse of light that precedes a lightning flash, and trips the shutter whenever it senses that burst. Since this device automatically tells the camera to capture an image when it “sees” a flash, you can set up the camera and let it do the work for you. However, it is not foolproof. There will be times that the trigger tells the camera to fire, even when there isn't a flash of lightning. Fortunately, you can adjust the sensitivity of the device if you find that there are too many misfires. 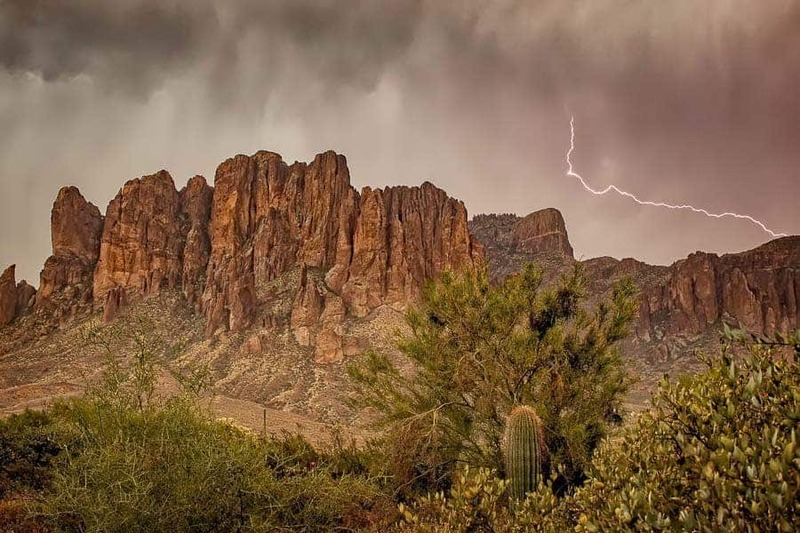 The great image below, by my good friend John Van't Land, was captured during the day using the Lightning Bug. Photo by John Van't Land. By now, you are probably beginning to wonder if this article is ever going to discuss camera settings. It did take a while, but we have finally made it! Camera settings are obviously going to vary somewhat, depending on whether you are shooting during the day or at night and whether you are using an ND filter or a lightning trigger. One thing that will stay the same, and an important thing to remember, is to expose for the highlights. In this case, the highlights are the lightning bolts that are flashing at you. Your surroundings may be dark, but that is going to change dramatically with each lightning flash. Setting your exposure for those flashes means that you will retain some of the detail in the lightning bolts and also be able to see some of the surrounding environment that is illuminated without blowing it out. This may take some trial and error, so do a couple of test shots and dial in the exposure that gives you the best image. Don't forget to look at the histogram on your camera's LCD to make sure you aren't clipping any of the highlights or that the image isn't too dark. Typically, you'll want to shoot at a wider focal length, somewhere around 24 mm or wider. If you are using a kit lens with a minimal focal length of 18 mm, that would work just fine for this. Using a wider focal length will give a wider field of view and cover more of the scene in the image. Since you won't know exactly where lightning is going to strike, it is helpful to cover as much of the sky as possible to maximize your chances of capturing the action. That doesn't mean you can't occasionally use a telephoto lens. In fact, if the lightning is a great distance away, this might actually be desirable. The opening image for this article was captured at 300 mm. If everything in the scene is quite a distance away from the camera, then depth-of-field is not going to be much of an issue when photographing lightning. Just set your lens to infinity focus and everything should be relatively sharp. To do this, point the camera at something far away, such as a distant light, and use auto-focus to acquire focus. Then switch auto-focus off on the lens or camera, and you will be all set. If you are including something closer than about 30 feet in the foreground, you may have to focus on the foreground object and take a shot of that, then set the focus to infinity to capture the distant scene. The two images could then be masked together in Photoshop. This will of course require that you be on a tripod so the two images are the same. Generally speaking, you will want to use the lowest ISO setting possible for the situation. The lowest native ISO will be either 100 or 200, depending on the camera you are using. Using a lower ISO setting will usually result in less noise in your images. If you need to increase the shutter speed, but don't want to change the aperture (or if the aperture is already maxed out), you may need to bump up the ISO. I typically prefer to be in manual mode when doing this type of shooting. This allows full control of the aperture and shutter speed to achieve the result that I want in the image. With that said, start out with a middle-of-the-road aperture of f/8 and set the shutter speed from there. 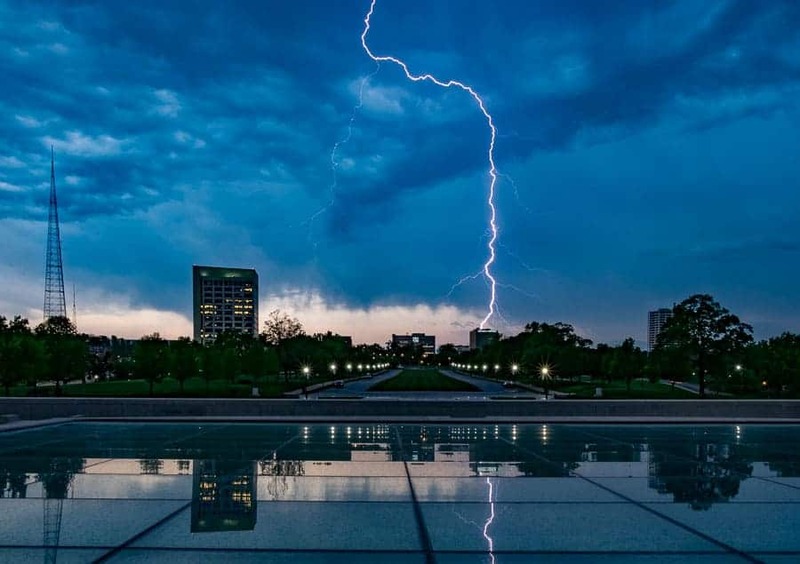 Shutter speed is going to vary, but keep in mind that leaving the shutter open longer might make capturing that elusive lightning bolt easier (unless you are using a lightning trigger). A shutter speed of 8 to 10 seconds would be a good place to be, but getting down to 30 seconds might be even better. If you are using a remote shutter release, you can set your camera to Bulb mode for a shutter speed of even longer than 30 seconds. Once you press and lock the button on the remote shutter release, the shutter on the camera will remain open until you decide to unlock that button. Another advantage to using a longer shutter speed is that you may be able to capture multiple lightning strikes in a single image. For the image to the left, the shutter was open for 82 seconds, and several bolts of lightning were captured. I prefer a slightly cooler look to my lightning images. When shooting at night, I will generally set the white balance on my camera to the tungsten setting, which will make the image a little more blue. However, if you are shooting in RAW (which you should, see below), white balance can be easily adjusted to taste in post-processing. Most people reading this probably already know this, and probably already shoot in RAW. If you don't, setting your camera to shoot in RAW will give you much more latitude with your images in post-processing. I prefer to keep all the data and adjust the images to my tastes rather than letting the camera do it for me. Yes, you may end up with a lot of images, which will take up space on your hard drive, especially if you are shooting using an intervalometer. However, most of them can be deleted later on the computer since only a few will have lightning in them anyway. In a ideal situation, you will be able to capture some amazing lightning images from an oncoming storm, then go inside before the storm arrives. Or, you will be capturing images from inside a building or vehicle where it is dry. Better yet, the storm may have lots of lightning, but you may never get any rain where you are. However, it is likely that sooner or later, you and your gear will get rained on. Cameras and lenses vary by model in how much weather sealing they have. Some lower-end cameras and kit lenses may not have much protection from the elements. Regardless, it's a good idea to be prepared with a few inexpensive items in your camera bag that can help add a little protection for your gear. You can use a plastic bag or even a shower cap in a pinch, but just go ahead and pick up a 2-pack of OP/TECH Rainsleeves and keep them in your camera bag for a rainy day. They take up very little space, are inexpensive, and could save your camera and lens. Something else to keep in mind is that if you are shooting in the rain, you will get water on the front lens element. For this, keep some microfiber cloths in your bag and occasionally wipe the front of your lens dry. We have established that lightning can be unpredictable and also discussed that having a good plan will greatly increase your potential for capturing some awesome lightning images. However, even the best laid plans aren't going to be a guarantee for success. Just like the great light may not always happen like we'd like at sunrise or sunset, great lightning may not always happen when going out to shoot. You may only see sheet lightning and no dramatic bolts, or perhaps no lightning at all. That's OK; as long as the conditions are favorable and you can safely do so, there are likely other things that can be photographed instead and you could still come home with some interesting images. If you are shooting during the day, maybe there are some really dramatic clouds or interesting cloud formations that you could photograph. Incorporate the landscape or cityscape around you with some foreground interest. If the clouds are moving quickly, you could use an ND filter to achieve long exposures and show motion. Or even take a series of images that can be put together to make a time-lapse video. If you are shooting at night, you could practice your lightpainting technique, or make some images with streaking headlights and taillights if you are near streets or highways with lots of traffic. Time is a precious commodity, so make the best of the time you have and test your creativity in the process. This image not only captured lightning, but also took advantage of cars passing by on the road below. Photo by Rusty Parkhurst. These are just a few tips to get you out there to try something you may not have tried before. Since you most likely already have the basic gear that is needed, then why not. With a little practice, you will soon be creating some amazing lightning images. One other thing that wasn't mentioned previously is to be patient. Allow time for the storm to develop and to come to you. If you spend time second-guessing yourself and moving around to different locations, you are probably going to miss the best shots when you are in the car driving. This is something that has happened to me. I have given up too soon on a location to try somewhere new, and in the end, would have been much better staying put. I hope this article will give you some ideas and be helpful for you. If you have questions or additional tips, please feel free to share in the comments. Thanks!